Whether you get to spend the Easter holiday with your sister or not, she’ll appreciate you sending her this beautiful card of a bunny-shaped tray full of chocolate egg candies. 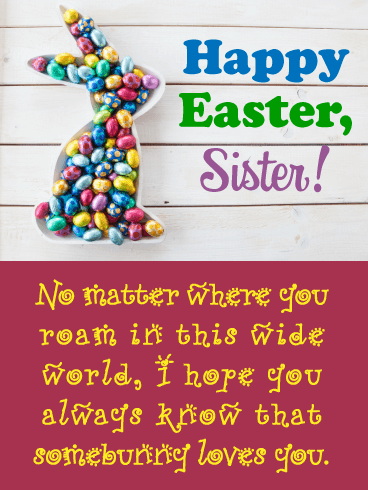 With the Sweet Somebunny Happy Easter Card you’re reassuring your darling sister that no matter how far she roams you’ll always be there for her. Somebunny loves her…and it’s you! The bunny on this card has a love for his carrot plant! 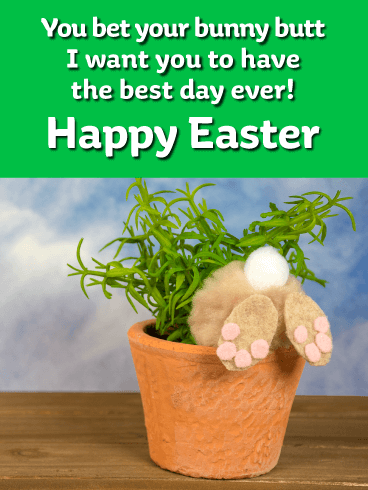 What a “hare”-raising a funny way to wish your friend a happy Easter! In fact, you hope their holiday is the best celebration yet. It’s a greeting sure to get plenty of laughs as soon as they see it. 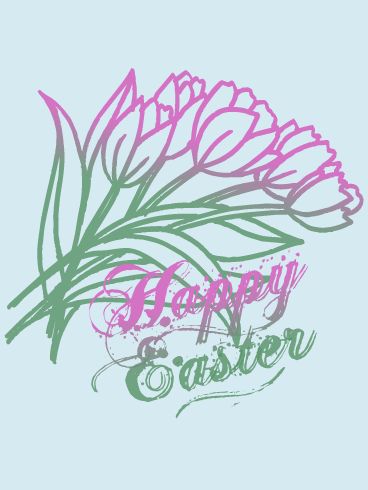 A sweet pastel pink background holds an even sweeter Easter wish for someone special to you. This holiday was meant to be shared with the people we love, sharing laughter and lively conversation while creating new and wonderful memories together. Featuring a gathering of beautifully decorated eggs and charming little flowers at the bottom, it's a lovely reminder for everyone to enjoy and embrace all the little moments of their celebration. 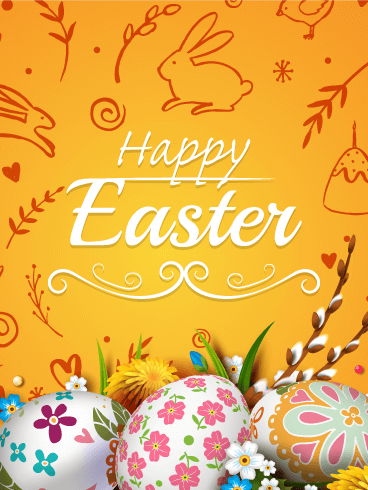 This shimmering and stylish card is a unique way to wish the special people in your life a Happy Easter. 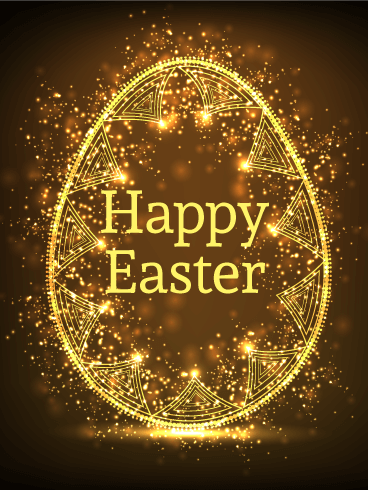 A glamorous golden background bursts with lots of glittery touches, while a brilliant egg is outlined right in front, featuring your greeting at the center. While the message may be simple, the elaborate design reveals your heartfelt sentiment in the most spectacular way! There's a style and sophistication to this Easter card, which is captured by the delicately hand drawn tulips in purple and green, which sit above the elegantly scripted "Happy Easter" greeting below. A subtle white background lets the beauty of it all shine through for someone special to you. It may be simple, but this wish holds a lot of sentiment behind it, reminding family and friends that you're thinking of them, today and always. This sensational Easter card was designed with fabulous bunny ears, flowers, pretty Easter eggs, and beautiful butterflies! It also contains words that will fill your friend’s heart with happiness. It will let them know that they are a lifelong friend, as well as a source of joy for you! 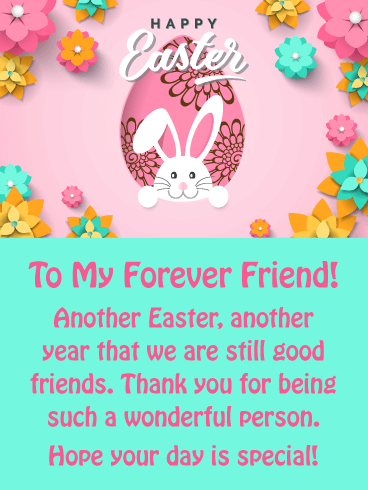 So wish your friend a terrific Easter with this amazing greeting card today! A pitcher full of tulips serves up your brightest Easter wishes for a friend who means everything to you. 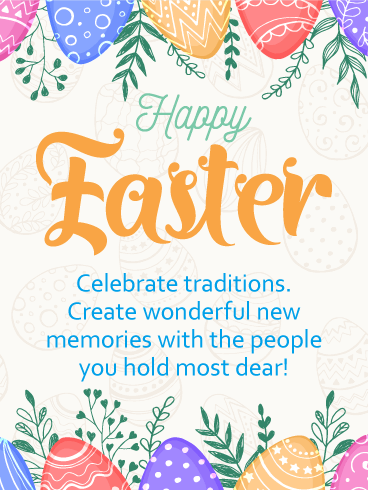 Two decorated eggs sit beside, and above are your heartfelt words, which will let them know that above all, you want them to have a holiday celebration that filled with warm, wonderful memories, whether you’re gathering with them or thinking of them from miles away. Delicate watercolor eggs and green leaves dance along the top and bottom of this Easter card, creating a certain nostalgia, which fits with the touching message at the center. It's a reminder to someone you care about to celebrate traditions while creating new and special memories with the people they hold closest to them. What a beautiful wish for anyone who treasures these joyful holiday moments. Happy Easter! 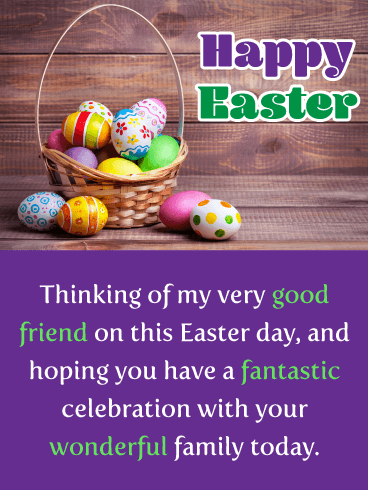 Celebrating Easter starts by sending Easter cards to your friends and family. 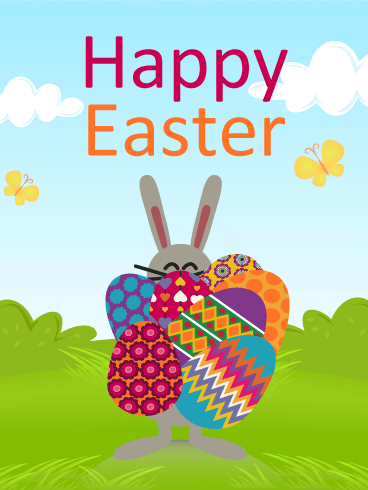 Send our great Easter cards to everyone to wish them a bright and cheerful Easter. This whimsical pink card is simply perfect for your sweet-toothed sister. Who says the Easter bunny can’t visit adults too? 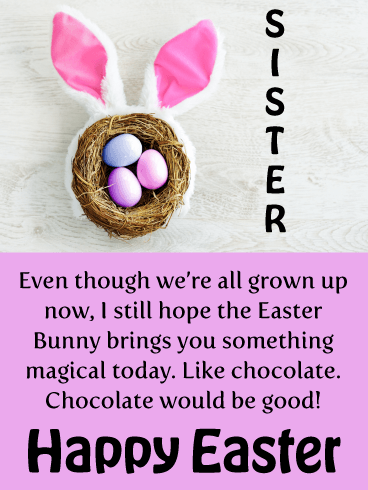 Wish your Sister a Happy Easter with the Grown-Ups Need Chocolate too card. 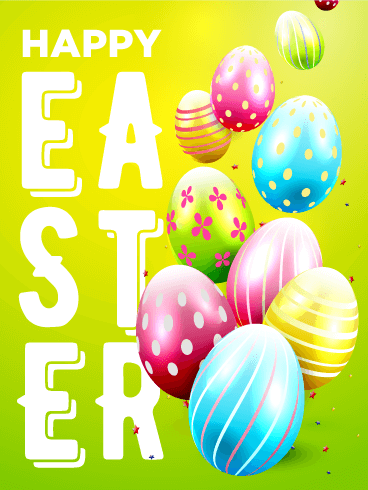 Bunny ears encircle a nest of dyed Easter eggs and a playful, stencil font completes the imagery. “Hoppy” Easter, now enjoy your day with plenty of chocolates! Touch your friend’s heart this Easter with a warm and lovely greeting card. Delightful Easter eggs are displayed in a creative way and feature decorative ribbons and flowers on them. The pastel colors make this card look extra special and add a touch of spring! The message will let your friend know that you are thankful that the two of you met so many years ago. This Easter card will truly mean so much to them. This quaint and charming Easter card features a gathering of fresh pink & yellow tulips alongside a basket filled with brightly colored eggs. A wooden background adds a rustic touch to your greeting, which is a perfect choice for anyone you want to share the joy of the holiday with, no matter how near or far they may be this year. There's a unique and charming quality to this Easter card. Against a rich orange background are hand drawings of bunnies, chicks, flowers and more, with a trio of decorated eggs at the bottom. All of these playful little touches are sure to touch their heart as they celebrate the holiday. Whether they're a close family member, friend, co-worker or acquaintance, they'll feel special knowing you took the time to remember them. 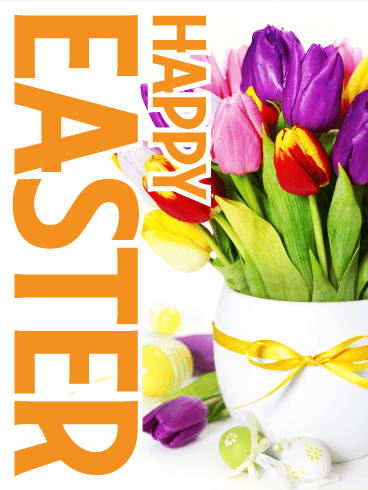 The brightness of spring is beautifully captured in this Easter greeting! An eye-catching yellow background is decorated by a wreath of pretty stenciled pastel eggs, each decorated in its own unique way. 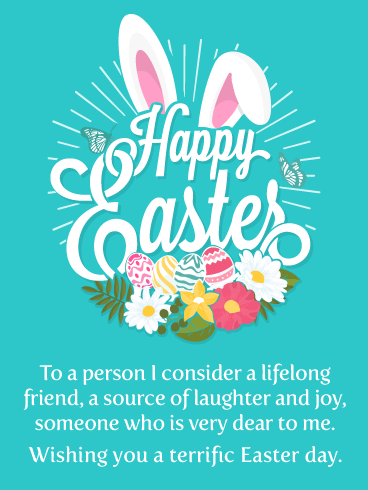 At the very center, in an elegant scripted font, is a "Happy Easter" greeting to share with any special some "bunny" this year. No matter how many miles away they may be, they'll appreciate the warmth and wonder of your sentiment as they celebrate the holiday. 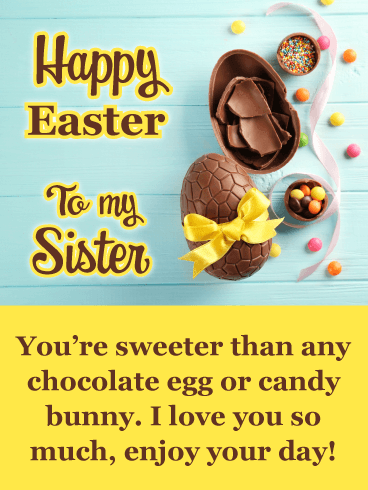 Is your sister as sweet as can be? 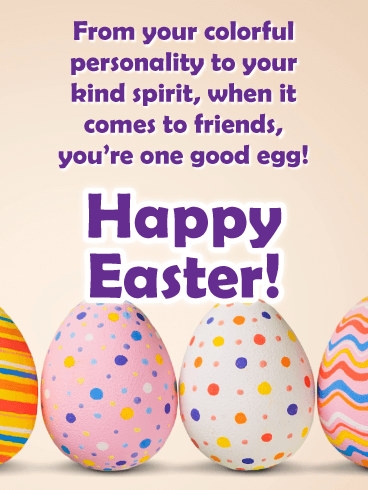 Send that sweet soul the Chocolate Eggs Happy Easter Card to spread the love this holiday! She’s cuter than any candy bunny or marshmallow chick and you want her to know how much you love her! Decorated with mouthwatering chocolate and bright candies, this thoughtful card is sure to make her day extra special. Sometimes a simple design says it best. 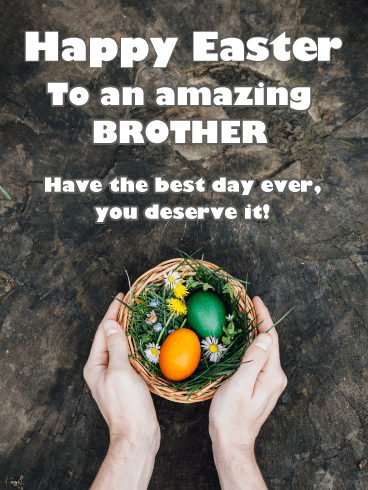 Send the Best Easter Ever Card to your favorite brother this holiday. It’s tasteful and elegant in its simplicity. A photo of a man’s hands holding a small basket of dyed Easter eggs accompanied by a to-the-point message wishing him the best day ever and reassuring him that he deserves all good things! 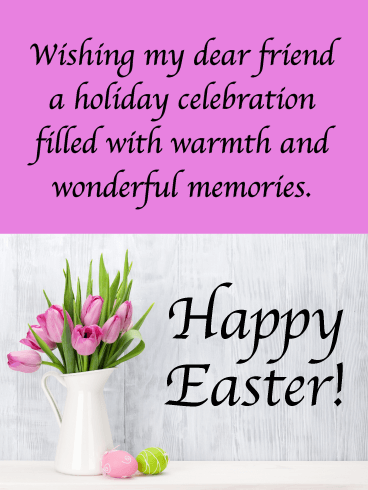 A simple "Happy Easter" greeting on this charming card holds your heartfelt wishes for a wonderful holiday celebration. A striking white background creates the perfect setting for the beautiful tulips gathered together, which bring a bright pop of color and cheer to the family and friends you hold most dear. This is a wonderful choice for anyone this time of year, letting them know they're on your mind and in your heart. This nature-inspired card brings with it your best wishes for a dear friend and their family as they celebrate Easter. A nest filled with speckled pastel eggs captures the beauty of the outdoors this time of year and comes with a sweet but simple sentiment, which thanks them for being such a wonderful friend. A bright, cloudless sky above and lively tulips springing up from the green grass below create a lovely backdrop for every Easter celebration. And the holiday wouldn't be complete without colorful eggs just waiting to be discovered! There's so much to love about this Easter card, which makes it a wonderful choice for someone special in your life. It's a reminder to them to gather with the people they love and embrace all the "beauty and brightness" that surrounds them. 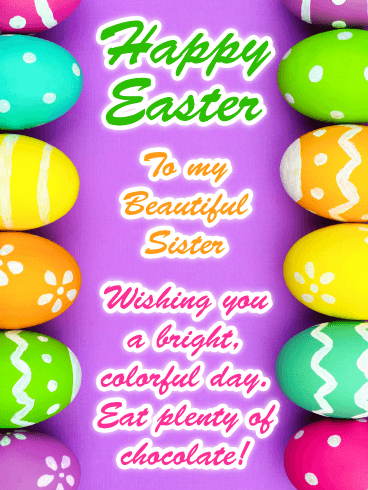 Say Happy Easter to your favorite sister in the whole wide world with this bright, bold card filled with pastel dyed eggs! 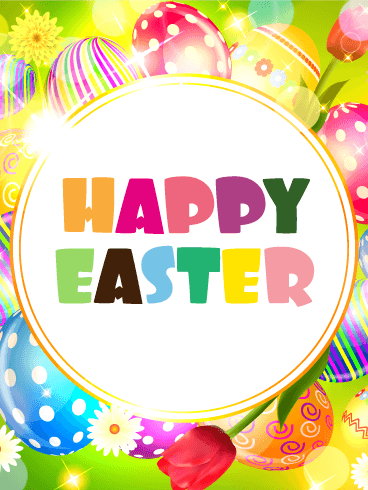 Send the Colorful Eggs Happy Easter Card to wish that fantastic woman a wonderful day chock full of chocolate! She will appreciate being thought of on such a beautiful occasion and with such a colorful, fun card too! This stunning Easter card is quite the eye-catcher! A beautiful card like this needs a beautiful receiver. 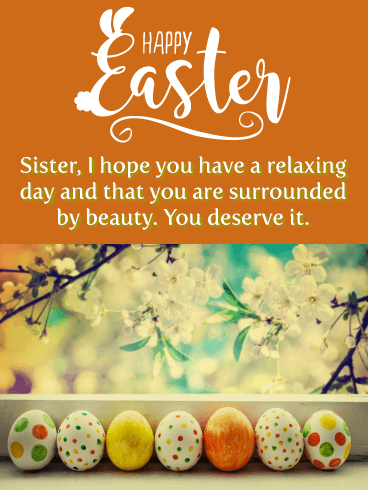 Send the Surrounded By Beauty Happy Easter Card to your lovely sister. Let her know she deserves good things like a day of relaxation and love. With tastefully decorated Easter Eggs and white blossoms, this card is elegant and sweet. Just like your sister! Send this endearing Easter card to all the friends in your life that make the holidays more special. This greeting card features two bunnies who are obviously friends and celebrating Easter together. It’s a wonderful illustration that makes this beautiful card a must-send this Easter day! Send these sweet bunnies over to your friend to brighten their day! This pretty Easter card is filled with the most beautiful Easter eggs you have ever seen. Detailed flowers were painted on these stylish eggs so that they look fantastic for your friend! Send this greeting card over to your friend today to get their Easter started off in the best way. They will be so happy you did! 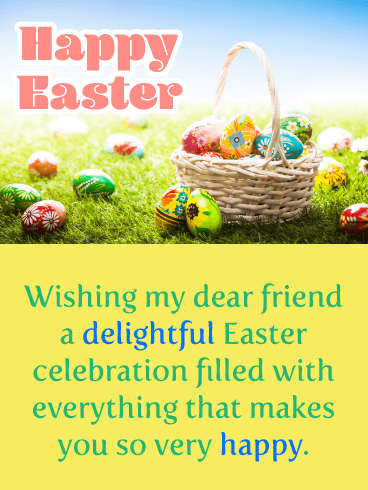 For a friend who brings sunshine and light into your life, wish them a happy Easter with this lovely and charming card. Featuring some of the symbols of spring: pretty tulips, decorated eggs, a bird’s nest, and butterfly, this heartfelt greeting will remind them how fortunate you feel to call them your friend. We can’t always be with our loved ones during the holidays. 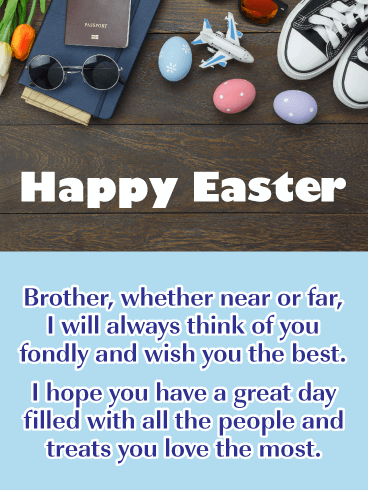 Send this thoughtful Long Distance Happy Easter Card to your beloved brother to wish him a great day even if he’s far away! The photo card has fun details to draw the eye such as sneakers, a passport, tulips, some decorated eggs, sunglasses, and even a tiny airplane. Sending this card will definitely show your love. 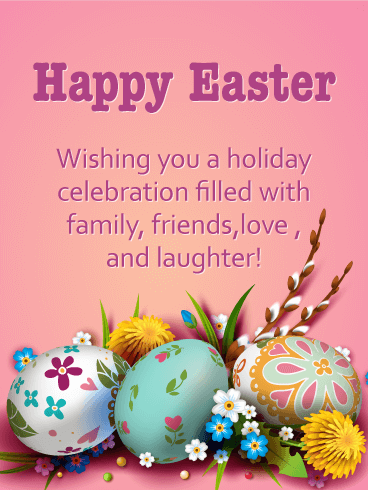 Wish your friend and their family a fantastic celebration with this marvelous Easter card. 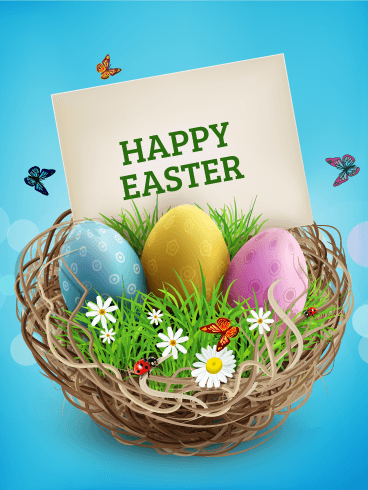 It features spectacular Easter eggs sitting in a basket, and a thoughtful message that will add joy to your friend’s heart. 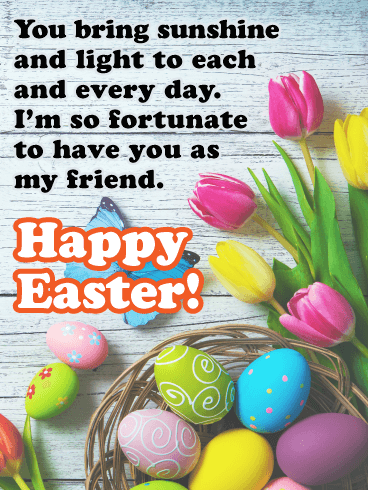 Easter is a day to remember everyone who is special to you, and sending this greeting card would be a perfect way to let them know how much you care. Colorful polka dot and striped eggs bring a fun and festive touch to this Easter card for a friend. And what really makes it the perfect pick is the message above, which let them know the many reasons you care about them so much and that when it comes to friends, they’re definitely one good egg! This unique Easter greeting lets everyone know it's time to celebrate! 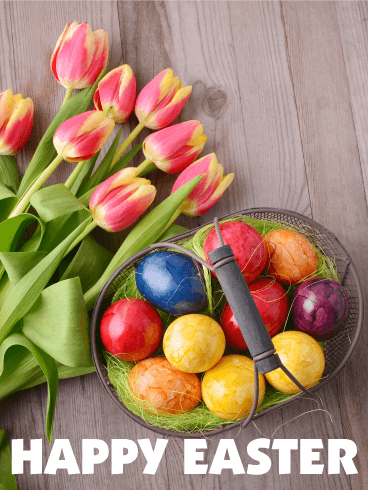 The word "Easter" is spelled out, each letter in a different pastel shade, and hopping alongside are brightly-colored eggs, all decorated in different patterns for a little added fun. No matter what their age, every "bunny" will love getting an Easter card so sweet from someone as special as you! Easter eggs are an important cultural symbol of Easter. 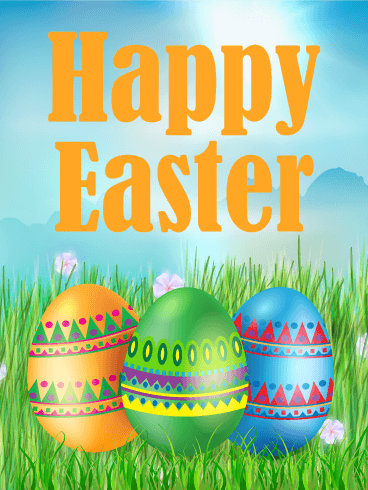 Choose this Easter egg card to celebrate the holiday. 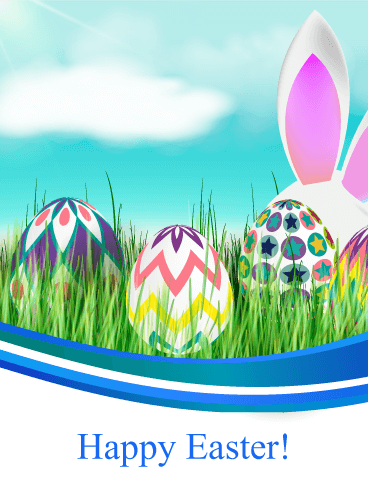 The beautifully colored Easter eggs will create holiday excitement. The flowers will also give people joy. 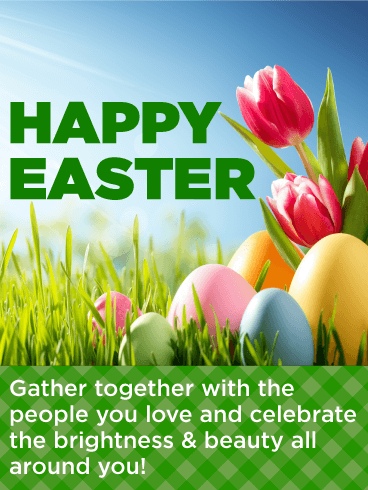 Send Easter cards to your family and friends. When it comes to friendships, theirs is one you treasure. 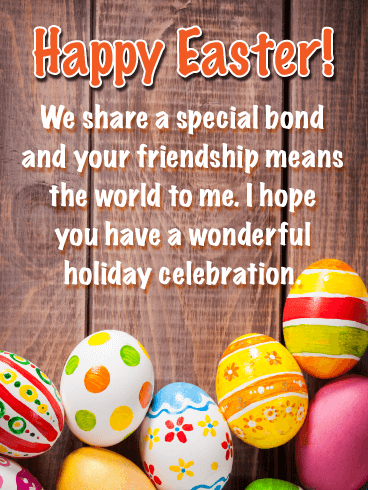 There is a special bond you share, and Easter is the perfect time to remind them. 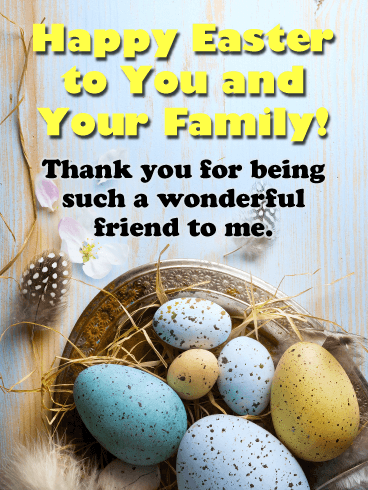 This charming and rustic card is decorated with brightly decorated eggs against a wooden background, capturing the joyous spirit of spring, a time to reconnect with the people we care about and wish them a wonderful holiday celebration. Easter time is a beautiful time of year. Spring is in full swing, and all around us, the world is filled with color and beauty. 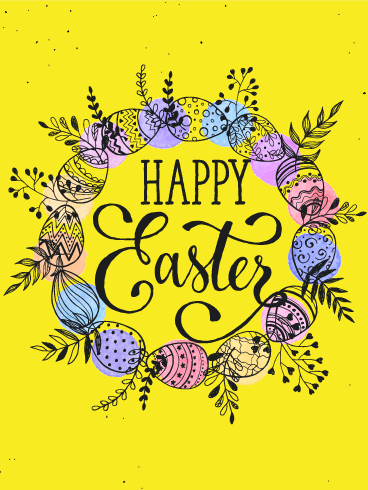 The wonder of the season is perfectly captured in this Easter card, which features a "Happy Easter" greeting right in the center and a lively background, complete with decorated eggs and flowers all around. It's a delightful choice to send someone who could use an extra dose of cheer! The happy Easter bunny is carrying several Easter eggs on this sunny day. This cute Easter card will make everyone smile. 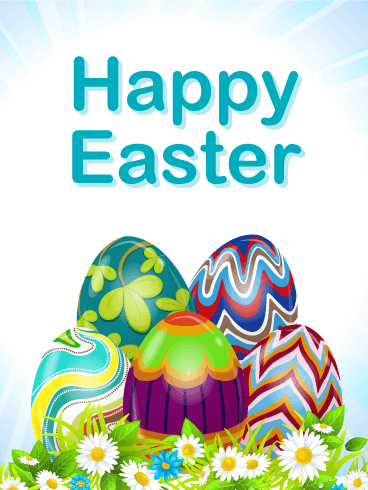 Find the many hidden Easter eggs like the Easter bunny in this card and send it to your friends and family! Do you see something that is hiding in this card? It is an Easter bunny! 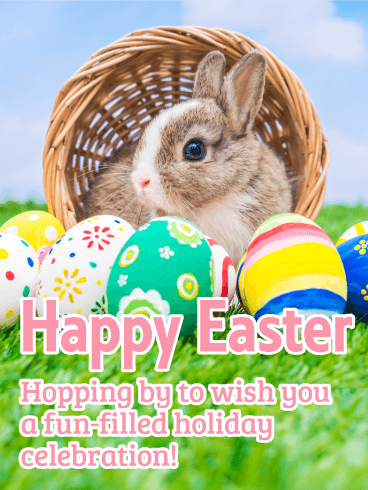 This Easter card includes colorfully painted Easter eggs and cute bunny ears. 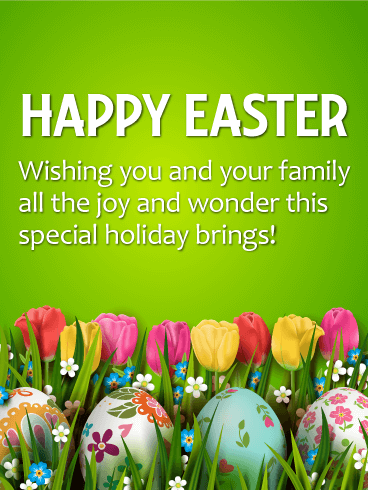 It is perfect to send to your friends and family to celebrate the holiday. Do you need an Easter card for someone you truly love, deeply respect, and ardently admire? 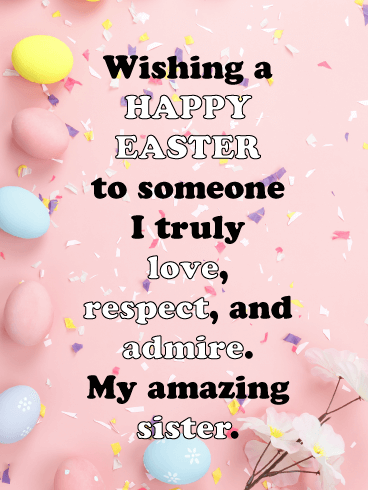 Well if it’s for your amazing sister, then look no further, we have the perfect card for you! Send that lady our Amazing Compliments Easter Card to put such a big smile on her face that it will probably stay there all Spring season long! If you are looking for a stunning Easter card to send to your friend this year, you have just found it. This eloquent greeting card showcases decorative Easter eggs surrounded by delicate white leaves and flowers. 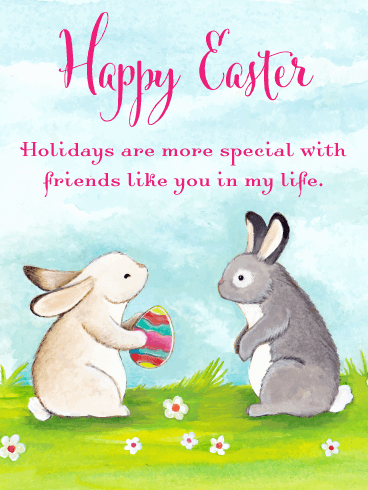 Wish your friend a memorable Easter celebration with this magnificent greeting card, it will make them appreciate you even more! 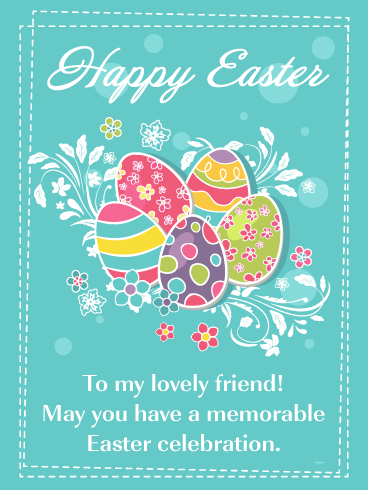 This artistic looking Easter card showcases a fabulous design that any friend will love. An eye-catching Easter egg is front and center with the words Happy Easter creatively displayed. Easter eggs fill the entire card and create a wonderful design that is perfect for anyone who likes sensational greeting cards! 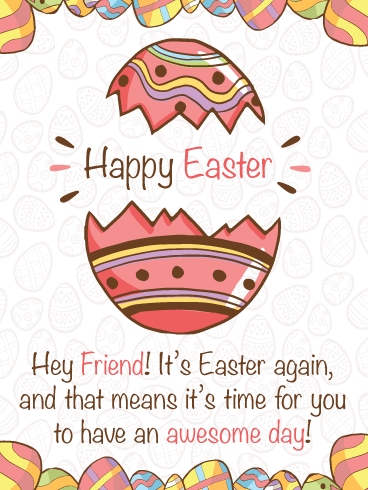 Let your friend know it’s time to have an awesome day with this impressive Easter card today!